The Democrats are screaming that the tax bill will add to the national debt. It might. Or it might not–depending on the growth of the American economy unleashed by lower taxes. 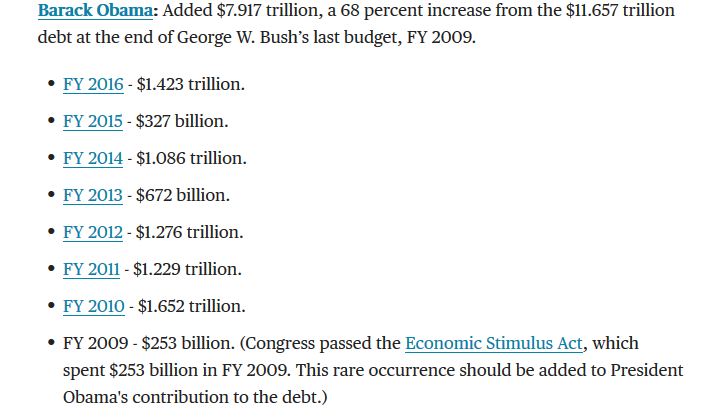 However, there are some numbers that those Democrats might want to consider before they scream too loud. 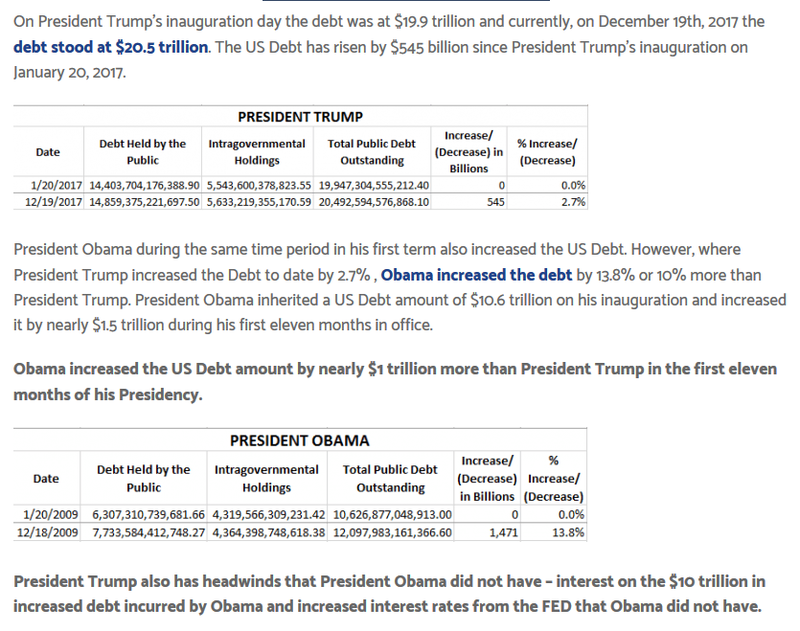 The major complaint that the Democrats have with the tax bill is that it is projected to increase the U S debt by $1.5 trillion. However, when compared to Obama President Trump already nearly has it covered. President Trump has already paid for nearly all of the tax cuts. Aside from that fact, whose money is it anyway? The tax cuts will allow Americans to keep more of what they have earned. That is a good thing. Congressman Steve King announces today that he is asking Chairman Kevin Brady of the House Ways and Means Committee to include King’s New IDEA (Illegal Deduction Elimination Act) legislation as a component of H.R. 1, the Tax Cuts and Jobs Act. King’s legislation, HR 176- The New IDEA Act, amends the Internal Revenue Code to make it unlawful for employers to deduct wages and benefits paid to and on behalf of an illegal alien. New IDEA also makes the federal E-Verify Program permanent. King, joined by 11 of his colleagues, made the request in a letter sent to Chairman Brady today. “Including this legislation in the Tax Cuts and Jobs Act is the right action for the American taxpayer—it preserves the rule of law and provides a significant tax savings. The Center for Immigration Studies (CIS) has estimated that eliminating deductibility for unlawful employment would increase federal tax revenues by approximately $25.4 billion per year, which is $254 billion over 10 years. 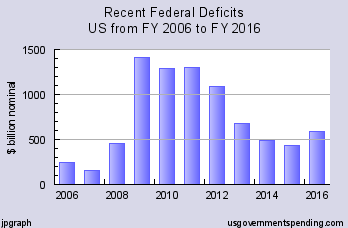 This amount more than pays for any increase in the deficit over the limit set by reconciliation. The signatories to King’s letter asking King’s New IDEA be included in the tax reform legislation include: Rep. Louie Gohmert, Rep. Paul Gosar, Rep. Mo Brooks, Rep. Matt Gaetz, Rep. Andy Biggs, Rep. Randy Weber, Rep. Lou Barletta, Rep. Scott DesJarlais, Rep. Duncan Hunter, Rep. Brian Babin, and Rep. Scott Perry. This is one of the best ideas to reform taxes and to begin to deal with the problem of illegal immigration that I have heard. E Verify would be a big step toward making sure that the workers in America are here legally. Lowering and Simplifying the Individual Tax Rates: The GOP proposal provides long overdue relief to millions of Americans by simplifying and lowering the individual tax rates to 12 percent, 25 percent, 35 percent and 39.6 percent. For married couples, the 25 percent rate starts at $90,000, the 35 percent rate starts at $260,000 and the top rate starts at $1 million. The bill will also double the standard deduction to $12,000 for individuals and $24,000 for families. Lowering the Corporate Tax Rate: This bill will immediately lower the corporate rate to 20 percent — the rate demanded by conservatives for months — making American businesses more competitive with the rest of the world and providing hard working Americans with a much needed raise. Rates for small business pass throughs were also reduced by 15 percentage points, down to 25 percent. Tax Free Entrepreneurship (Full Expensing): The GOP proposal includes full expensing for some investments that phases out after 5 years. This is a necessary boost to investment in the short-term, though improvements could be made as the process advances. Establishing a Territorial Tax System: This bill attempts to eliminate the double taxation that defines our current worldwide tax system, though there are some provisions that could undermine the full value of that reform. Stay tuned for a more in-depth analysis. Ending Cronyism in the Tax Code: Conservatives have also been fighting back against big-government special interest groups. The plan eliminates many special interest provisions including the State and Local Tax Deduction (SALT), though it allows a write off for property taxes. If not for conservative pushback, the swamp creatures would have been far more successful in defending the broken, corrupt status quo. Child tax credit goes to $1600 from $1000 plus additional $300 credit for parents and non-child dependents. The Death Tax exemption will be doubled and eventually phased out after five years. Preserves the home mortgage interest deduction for current mortgages and limits the deduction to $500,000 for new mortgages. Preserves the Charitable Tax Deduction. At first glance, the preliminary text released today has the potential to unleash economic growth, create American jobs, increase wages for American workers, allow families to keep more of their hard-earned money, and make U.S. businesses competitive across the globe. 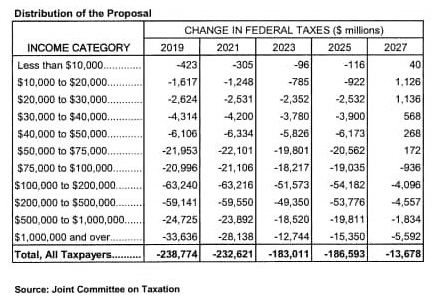 According to documents released by Republicans on the House Ways and Means Committee, a typical middle-income family of four, earning $59K (median household income), will receive a $1,182 tax cut under this bill. Yesterday The Washington Times posted an article about one aspect of the tax bill that will limit fraud and save the taxpayers billions of dollars. …But the new tax overhaul tries again, calling for taxpayers to have to submit work-eligible Social Security numbers in order to claim the credits. In the case of the child tax credit, activists say that while the parents may be in the country illegally, their children are often U.S. citizens who deserve the credit. …Many illegal immigrants pay taxes using Individual Taxpayer Identification Numbers, which the IRS issues to those who aren’t authorized to work in the U.S., but whom the government still wants to pony up to Uncle Sam. The IRS pays out billions of dollars a year in tax credits to people filing using ITINs each year, according to the agency’s inspector general. The inspector general has repeatedly urged the IRS to stop making the payments, but the agency has refused, saying it interprets the law related to those tax credits to cover illegal immigrants as well as other taxpayers. The obvious question is why is the government making payments to people who are not in America legally and have no right to work here. Boston, MA…Today a group of taxpayers gathered on the outside State House stairs to announce that they are filing a ballot initiative to cut the linkage between the gas tax and inflation which the legislature recently passed. “It is outrageous that Beacon Hill is increasing our gas tax every year for the rest of lives without a vote. That’s taxation without representation. It is wrong and we are going to stop it,” said Steve Aylward, who is the Republican State Committee man that ran the very successful signature drive for Mike Sullivan last winter. The initial supporters of the ballot initiative include Marty Lamb, Chris Pinto, Republican National Committee woman Chanel Prunier, Les Gosule who passed Melissa’s law in 2012, Jeff Bailey, State Representative Leah Cole, Stephen Coulter, Alex Vispoli, State Representative Geoff Diehl, State Representative Jim Lyons, State Representative Marc Lombardo, Rick Gleason of the Massachusetts Motorcycle Association, Rich Howell, Paul Craney of Mass Fiscal, Desiree Awiszio, Jamie Kang, Mike Mosca, Marylou Daxland, Katie Regan, State Representative Shaunna O’Connell, John O’Mara of the Northborough Tea Party, Barbara Anderson of Citizens of Limited Taxation, and many more. Last month the legislature passed the so-called transportation bill which included a gas tax hike, a new tax on computer software, and a cigarette tax increase. It also linked the gas tax to CPI which allows the gas tax to increase every year without a vote of the legislature. “This year our state took in over $600 million above projections. We don’t need this tax package. I voted against this bill in the House and I am not going to sit on the sidelines now while the state reaches into our wallets every year for the rest of our lives for more and more money without an accountable vote being taken,” said State Representative Diehl. “How much more will Beacon Hill take from our wallets? We don’t know. We just know it is going up automatically with no debate, no input and no oversight,” said Pinto. “Our elected officials have failed us. Our only alternative is to pass a ballot question that will stop this taxation without representation,” said Marty Lamb. The attorney for the group is former U.S. Attorney Mike Sullivan. Since launching the facebook page last week the group has over 695 friends. The plan is to launch a website shortly in preparation for collecting 100,000 raw signatures. Just within the last week, the price of gas has increased 10 cents per gallon. The new normal is over $3.50 per gallon. This high price is stretching family budgets. Whether it is filling up at the pump or buying food trucked to the market, we are getting hit hard in the wallets. The situation is going to get worse if Beacon Hill lawmakers have their way. Right now, a committee consisting of 3 House and 3 Senate members are meeting to negotiate the differences between the two tax bills. It is not a matter if the gas tax is increasing it is a matter of how much and how often. If the tax package is signed into law the gas tax will be forever linked to inflation. It is the gas tax increase “to infinity and beyond.” In other words, there will be an automatic gas tax increase every year. And the legislature never has to vote to raise it again. How convenient. But for the rest of us, it means taxation without representation. There is no need for higher taxes. This week’s report from the Auditor shows close to $100 million in fraud just within the Department of Transitional assistance (welfare). The crime lab scandal is costing us $332 million. Overall it is estimated $1.8 billion of waste. I urge readers to call the State House (617-722-2000) and express their opinion on the gas tax. There is no need for the tax increase and it should not be automatic. Taxation without representation should not be tolerated. If the bill being discussed is passed, the State of Massachusetts can automatically raise gasoline taxes without a vote by the legislature. Therefore, no one has to go on the record and be held accountable for the tax increase. This is a liberal lawmaker’s dream and a taxpayer’s nightmare. On Friday, Forbes Magazine posted an article about the Affordable Care Act’s (ACA) health insurance tax. I hate to admit it, but this is news to me. I didn’t realize that there was an entire new group of taxes in Obamacare that will impact the middle class and the elderly. …the tax increases that remain on the books will cost taxpayers more than $675 billion over the next ten years. Chief among these will be the sales tax on the purchase of health insurance, totaling $101.7 billion, and making it larger than all the other industry-specific taxes combined. This is one more reason to repeal Obamacare. I suspect there may be a lot of Democrats at this point complaining that this is not what they signed up for. If it is what they signed up for, they should be voted out of office.